Backpacks There are 13 products. Made from 600D Polyester. Large zippered main compartment with headphone port. Side mesh water bottle pockets and padded back panel. Available in Blue, Grey & Red. Top of the range backpack. 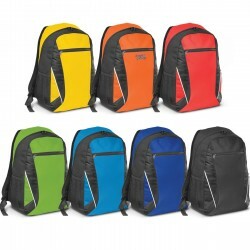 Manufactured from 600D nylon and fully padded throughout including the base and shoulder straps. Has compartments specifically designed to securely hold both a laptop and a tablet as well as a mesh pocket for charging cables and accessories. Protect a laptop in dynamic style with Swiss Peak. 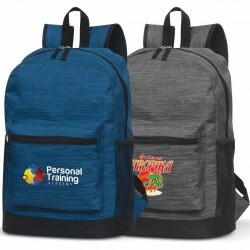 This robust 1680D heavy polyester backpack offers a fully padded laptop compartment as well as comfortable padding on the back and shoulder straps. It has additional compartments and an organiser with zippers that can be locked. This exclusive design has a designated laptop-only section that unfolds to lay flat on the X-ray belt to increase your speed, convenience and security. (Pens, Laptop and other devices shown are not included). Side entry laptop compartment holds up to 17 inch laptops.